How many things can you do in a day? 10? 20? 50? If 190 requests are made of you each day and you can only do 20, how many times do you need to say "No"? Do you say "No" 170 time a day, or do you say "Maybe" or "Later" of "I'd like to someday"? Much of the clutter surrounding you is simply generated by those unmade decisions. How many times do you pick up a piece of paper, look at it, say "I don't know what to do with this," and set it back down? The first time you have a piece of paper in your hand, you know 99.9 percent of the time as much as you will ever know about that piece of paper. So JUST MAKE A DECISION. Not making a decision about handling papers is my most difficult organizing challenge. Usually the problem turns out to be not having set up a truly functional system to handle them or not having the system in a convenient location. But, often the problem is psychological: simple procrastination because shuffling papers is just no fun. Maybe a little Funky Shui could help! This is great Jeri! I think I will have to add this to my book list! I love this perspective... it's really motivating! Cynthia, the "not having set up a functional system" issue is one that the author mentions. It's why this is her Step 4, because the system-setting-up work is handled first. And this is a bad habit I can fall into myself if I don't watch out; I'm sure that's why her words grabbed me the way they did. 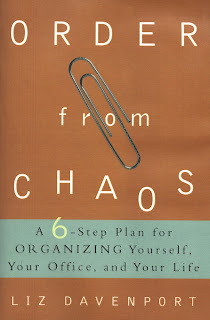 Megan, I'm so glad you found it useful; no matter how many books I read on organizing (and I've read a LOT), it seems I can always find someone with a slightly different (and helpful) perspective.